A cure for obesity, worth billions. A death in a clinical trial. When patent lawyer Daniel Marchmont agrees to act for Calliope Biotech, he doesn’t know what he’s getting into. The first lawyer on the case is dead, and a vital lab book is missing.Daniel and his wife Rachel are hoping biotechnology will also provide a cure for their daughter Chloe, who suffers from a devastating genetic disorder. Then the unimaginable happens, and they face a moral dilemma that threatens everything. Meanwhile young researcher Katie Flanagan suspects something is very wrong in the lab. But knowledge is dangerous when someone is playing a perilous game . . .
Read an interview with Christine about writing Deep Water on Sue Hepworth’s blog: It’s like all her books – intelligent, atmospheric and full of suspense. I know, because I’ve read it. Today, I’m honoured to have her as a guest on my blog, answering my questions. Read an interview with Christine about writing and Deep Water on Clothes in Books. 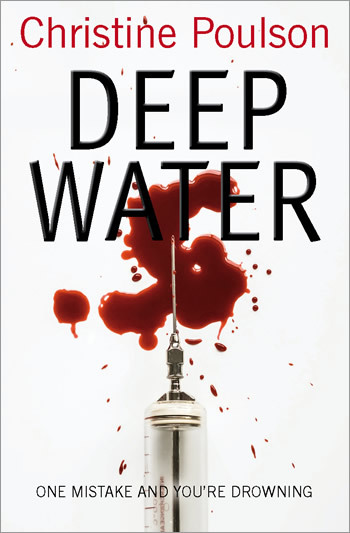 ‘Deep Water is an intriguing and original thriller, with the serious issue of medical ethics at its core.